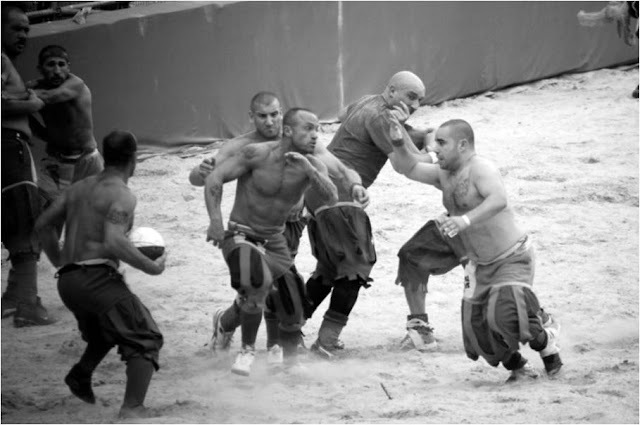 Calcio Fiorentino – does that ring any bells in terms sports? It is almost certainly not one you played at school but it has weathered the centuries well and is still played in its home town of Florence. It has been played since the sixteenth century. 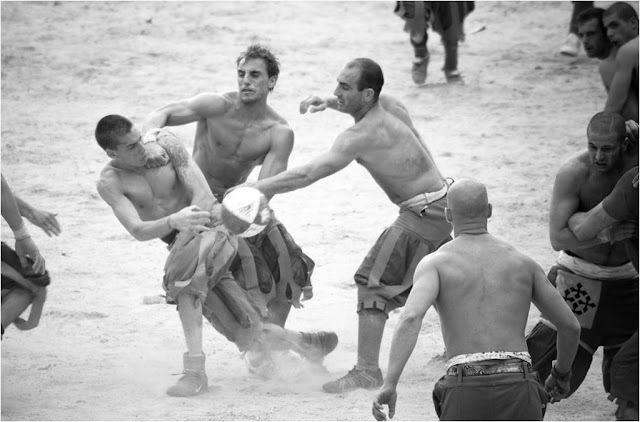 The game – Calcio for short – must be the original extreme sport. And boy, oh boy – is it extreme. Image Credit Flickr User cialis!! It is played by the sort of men who, if you met them in real life are probably real gentlemen. Yet if you were to come across them on a dark night you would probably be forgiven for hurrying past them or turning tale and running. These men look mean. 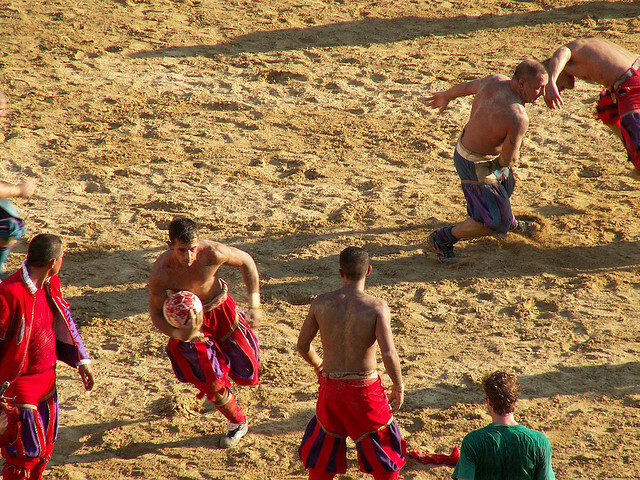 On the Calcio Fiorentino pitch they seem to be participating in a pitched battle, like something out of Highlander, Italian style. 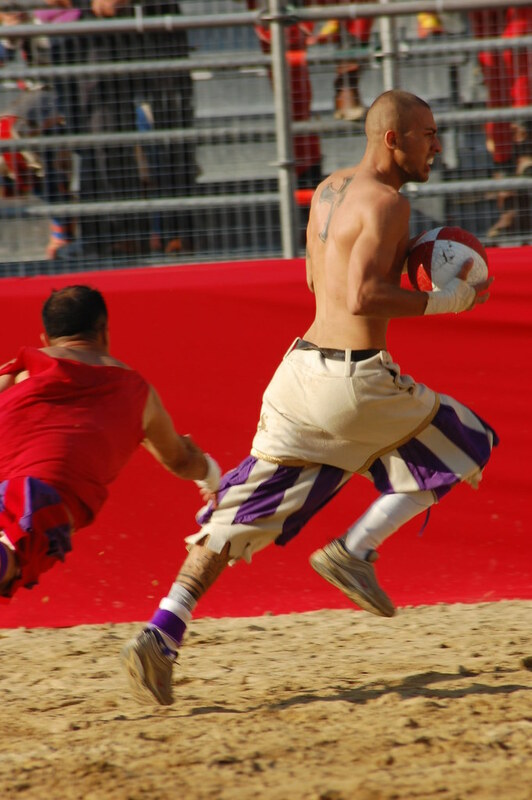 The game is a combination of football and rugby and is very much an archaic predecessor of the two. 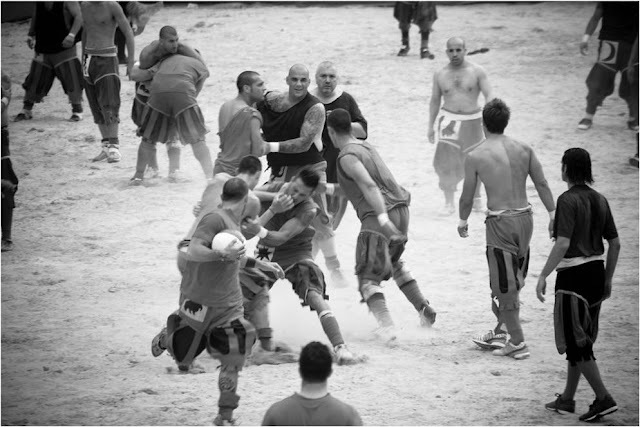 Throw in some high powered martial arts and a fearlessness about being hurt that most professional soccer players would be dumbfounded by and you have a bruising, anarchic and exhilarating spectacle of sport. 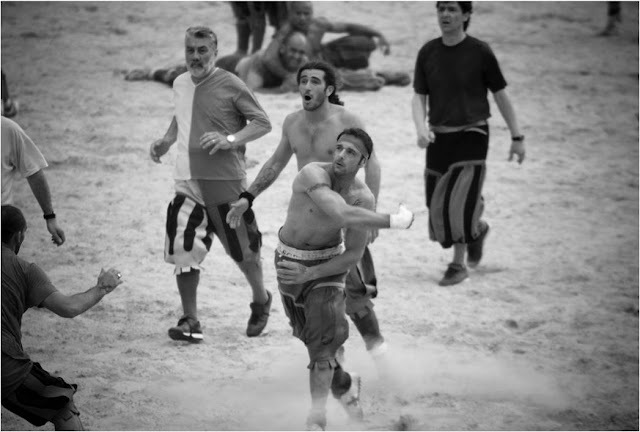 If you are Italian then you already know where this sport originates but in the English speaking world we know the place as Florence. 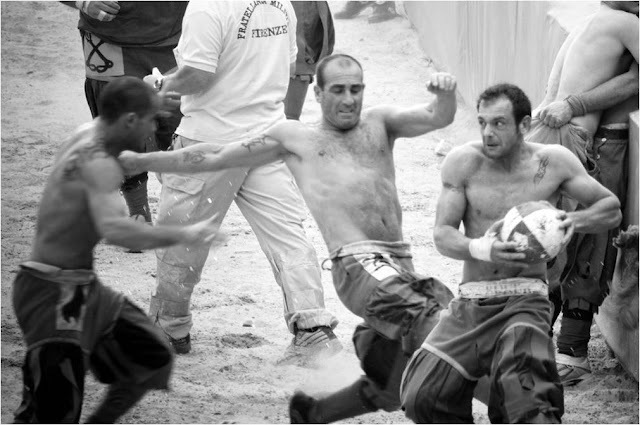 The word calcio is the Italian verb to kick – and so the sport could translate as Florence Kick or Florence Kicking. We like the term FK itself – it is short and sweet and there are two missing syllables in the middle that would otherwise make up a naughty word. But you do want to exclaim F**K!!! when you see this sport in action. 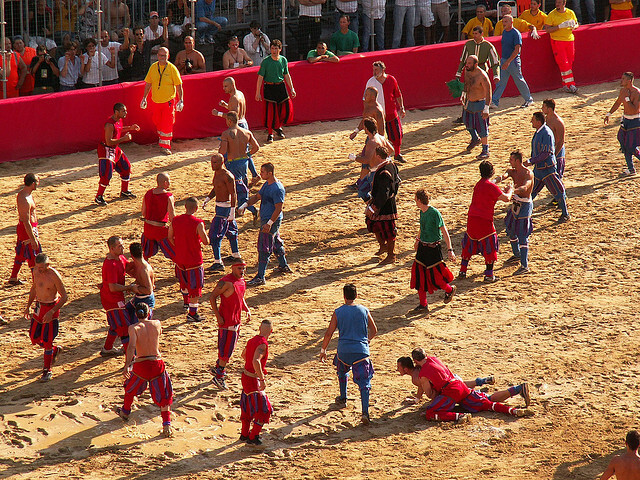 Funnily enough, kicking is one of the few forms of violence that is not countenanced on the Calcio Fiorentino pictch. If a boot makes purposeful contact with a head that is considered a definite foul, as is sucker punching. However, pretty much everything else is fair game. Head butting – yes, why go ahead, sir! Punching – as long as it is not of the sucker variety then that too is fine. 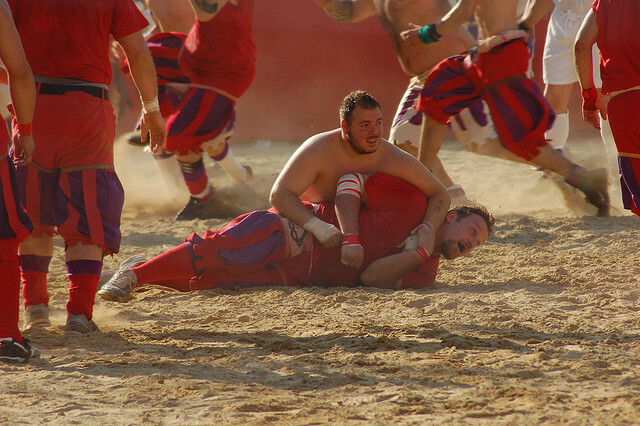 Elbowing – of course! As for choking – go for it. It seems at first sight that there is very little to avoid the local hospital in Florence being half full every time this game is played. 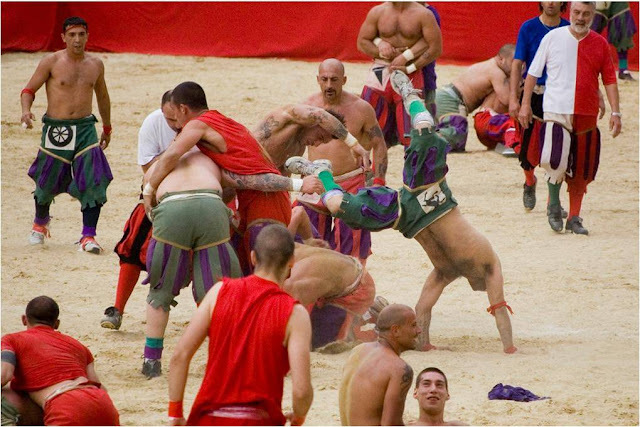 Yet there are some rules – otherwise this would not count as a sport. Like most ball sports the object of the exercise is to score more points than the opposition. This is done by netting the ball in to the goal. So far, so straightforward. Yet the goal mouth runs the entire width of the field – a 100m x 50m sand pit. You can see why there is such a melee with such a wide goal. The game is played with no breaks, no time out and no substitutions over a period of fifty painful, agonising and emotional minutes. 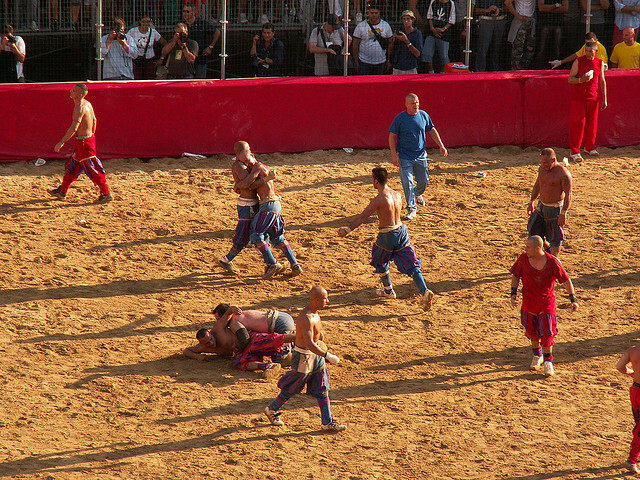 Eight officials (is a main referee, six linesmen and a field master ) prevent complete anarchy from breaking out, which may seem like quite a number. When you take in to account that there are twenty seven men on either side in this full throttle, high energy game then that doesn’t seem an inappropriate amount. 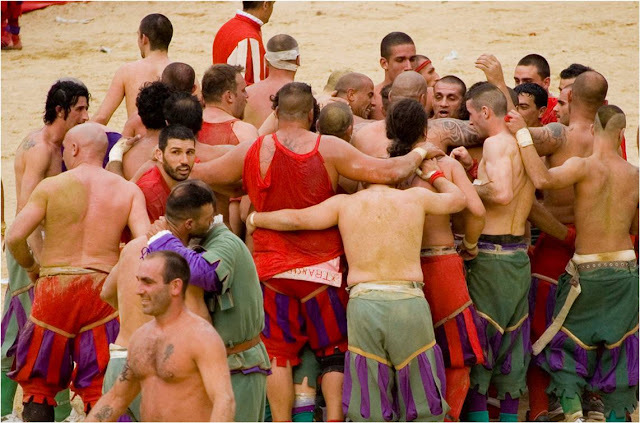 As you can imagine the sport, while hugely popular and an immense draw for tourists, is rather too rough and tumble to play all year round without the players suffering too many injuries and concussions. 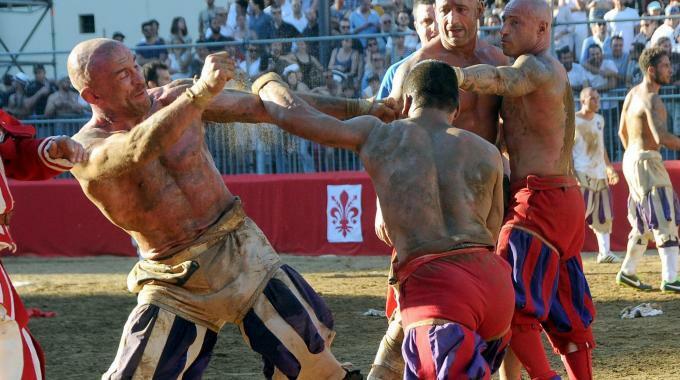 So, it is restricted to three matches each year in the gorgeous Piazza Santa Croce at the heart of Florence each year. As many as ten players from each team are simply there for the brawl (which is, after all, part of the game). In other words they are there not for their skill with a ball but there skill to propel other players skywards, to the earth or in to oblivion. Their job is to physically stop the other team from getting to their goal. The rest are generally football and rugby types whose skill and speed will hopefully help them avoid the clutches of the brawlers. It must be said though, that there is usually plenty of blood spilled in the fifty minute duration of a match and a number of unconscious players. 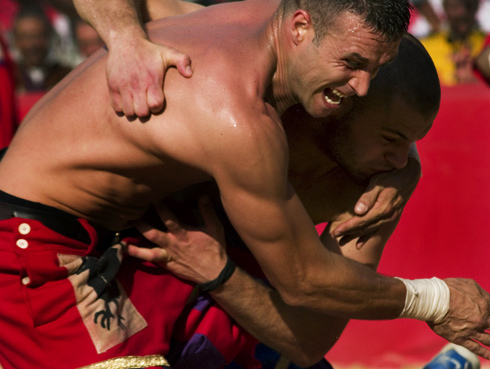 If you like your sports rough and ready, then this is the one for you. The three games are played among four teams. These are the Santa Croce who play in Blue and the Santa Maria Novella who play in red. 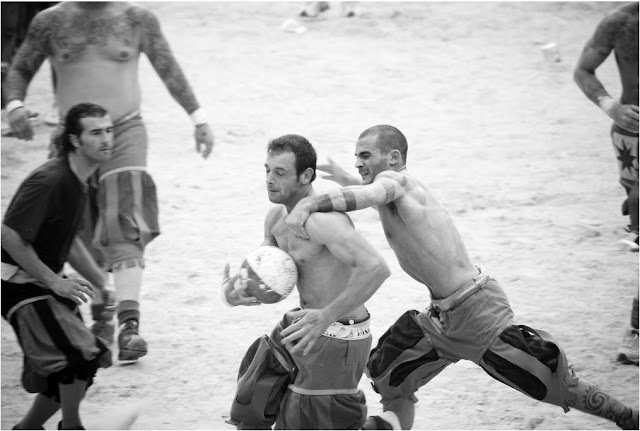 They are joined in competition by the Santo Spirito who wear white and the San Giovanni who play in green. 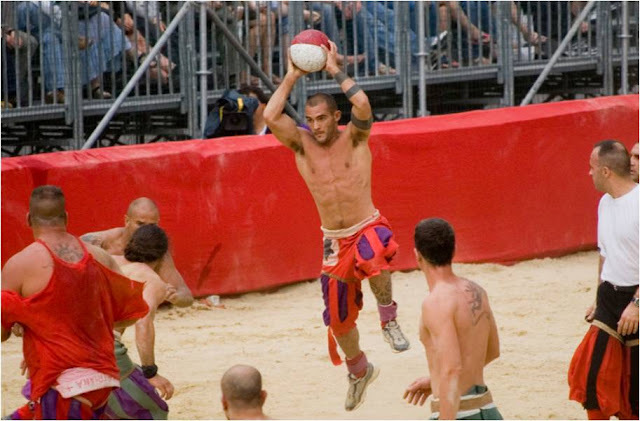 Originally the sport was devised for sons of the nobility but after a hiatus of a few hundred years it was brought back and now anyone can play. Plus there are no hard feelings at the end of the match. 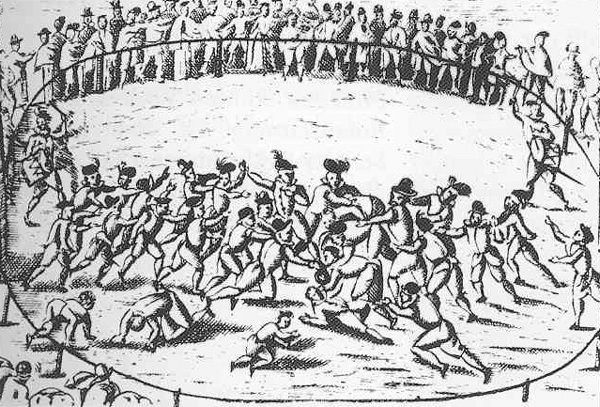 The game originates in the sixteenth century and must have been going some time before the first rule book was published in 1580. 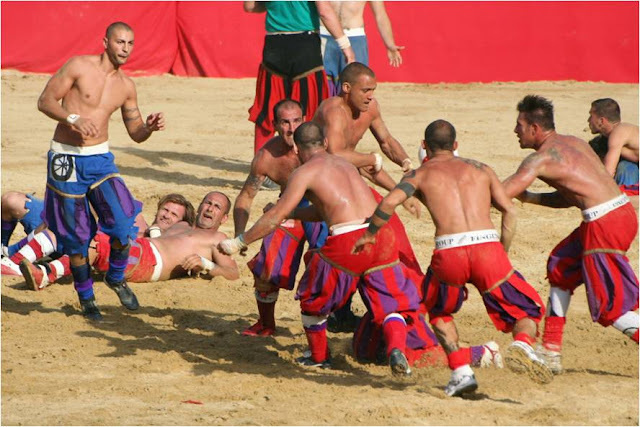 It must itself have been an evolution of the Roman sport of harpastum, which like calcio had a team of 27 on each side. 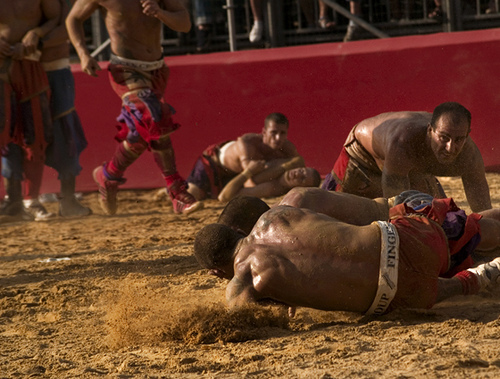 The impression from contemporary descriptions is of a game fairly similar to rugby. There is much pomp and ceremony before the game starts, as you can see in the video above, which also includes a lot of action! World in Sport would like to very much thanks the following Flickr users for giving us kind permission to reproduce their photographs here. Please visit their photostreams and websites by following the links below. Paolo Corti known on Flickr as cialis!! Flickr user lorZ – additional information here.